Argentario: a travel guide to the Argentario, campsites, hotels, holiday homes, apartments, real estate, accomodation, boating, beaches, sightseeing, photo gallery, top things to see. Argentario: marvellous foreland sorrounded by the sea and connected with the mainland by two long, narrow strips of land, called Tombolo of Giannella and Tombolo of Feniglia and also by an artificial istmo created by the dam of Orbetello. 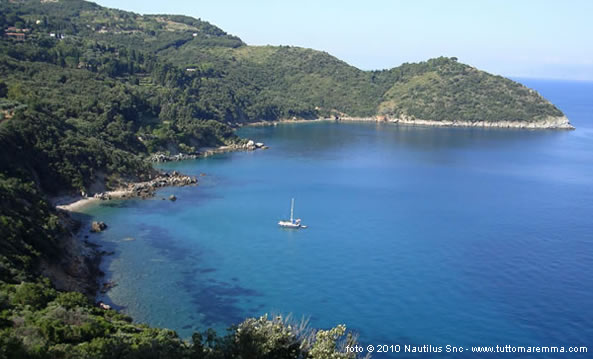 From Monte Argentario two famous and welcoming tourist towns border the sea: Porto Santo Stefano (with its hotels, diving, real estate agencies, seamanship services, ecc.) and Porto Ercole (with camping, hotels, ecc. ), two ancient fishing villages that have become one of the most important tourist destination over the years. Argentario attracts tourists for its unique landscape, for sea environment, and for its climate, so mild to let it ideal an holiday all the year. For trekking and bike lovers, in the internal zones of the foreland you can find many paths that go up from the sea to an high of 635 mt (telegraph point), crossing flourishing Mediterranean maquis and admiring very beautiful views. For golf lovers, Argentario Golf Club is a park of 77 hectares with a camp of eighteen-hole golf course located in a natural amphitheater formed by olives and maquis, with an extraordinary panorama. Among other characteristics of Argentario we can underline a very varied sea environment able to satisfy all different kind of people. The two "tomboli" are long, narrow strips of sand sheltered by shady pinewoods that let these lands very quiet and easy to reach. Besides, Argentario was already famous in the ancient times (as showed by the presence of the Roman Villa of "Domizi Enobardi" near Santa Liberata) and important ancient buildings have been preserved since now like Spanish forts and military watchtowers built, in the XVI century, to defend the territory from Saracen pirates in the XVI century. Finally, we can't forget to point out the regional cooking, with recipes that put together natural tastes and seafood. The most famous recipe is the fish soup called "caldaro". In this area are present very good wines and olive oils thanks to farmers' centuries-old job that have created terrace cultivations on this "reef called Argentario". The main folkloristic event is Palio Marinaro of Argentario.